VWVanagonCamper.com is a resource site and North American Classifieds. The primary focus is 1980s Volkswagen Type 2 (T3) “Vanagon” made into camper vans. This includes both professionally produced models and DIY homemade conversions. Read more below for our site mission and how we manage our classifieds. If you are interested in early model Type 2 (T2) Microbus campers check out our website at VWBusCamper.com or if you are looking for newer models see VWEurovanCamper.com for our Type 2 (T4) resource. VWVanagonCamper.com is a site focused on 1980 – 1991 VW Vanagon Westfalia Camping vans and T3 DIY Conversions. We focus on covering the important details on the Vanagon history, key features and a brief look at specifications. On our site you will find links to where you can buy tech manuals, conversions guides and related Vanagon books. We also point you in the direction of where to find OEM parts and aftermarket accessories. Additionally an important and useful feature of VWVanagonCamper.com is our comprehensive US & Canada classifieds section where you can find VW Vanagon Campers for sale across English speaking North America. Not only do we provide sellers the ability to list here directly with us but we also aggregate Craigslist posts and eBay auctions in order to serve as a one stop shop for buyers. We strive to be a twofold service for VW Vanagon Camper buyers, sellers and enthusiasts alike. Buyers: Our obvious service to buyers is to be a directory of all current VW Vanagon Campers listed for sale across the United States and Canada. If you are looking to buy a Vanagon Camper you can jump into our classifieds by using the navigation in the header or to the far right (bottom for mobile) or accessing our search box for specific queries. Sellers: We provide Vanagon Camper sellers with the ability to post their vehicle for sale directly on our site free of charge. We have a simple one step process for doing this. Check out our Ad Submission page to list your camper for sale. Buyers & Sellers: Another benefit we provide to bother buyers and sellers is unique and has not been done before. 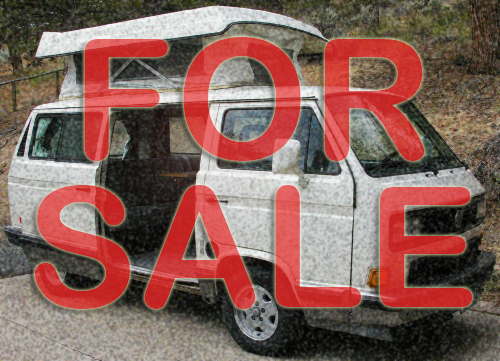 We serve as a database for past VW Vanagon Campers that have been listed for sale. As ads age / expire and Campers are sold we do not remove them from the site but yet mark them as sold. This allows both buyers and sellers to see what various condition Vanagon Campers were listed for (asking price) in several regions (ad location). The goal is to be the ultimate database and fair market price history tool. We do our best to keep our listings and database current and correct. Please visit our Website Disclaimer for more information on this.